What factors hold back UK recycling? This is a busy season for policies affecting the waste sector and recycling. The European Commission set out a ‘mini-package’ of 20 out of 54 action points for its circular economy (CE) proposals on 25 January; Defra is set to unveil the framework for its strategic 25-year plan for the environment and the Gov­ernment’s chief scientific adviser Mark Walport was due to publish his report on waste-as-resource. And the business department’s new industrial strategy looked to ”secure the economic benefits of the transition to a low-carbon economy” when it was published on 23 January. After the first ever slump in the UK’s household recycling rate, these initatives cannot come soon enough. The CE proposals from Brussels included a 65% household waste recy­cling target for municipal waste by 2030, a tough call indeed for the UK with its 2020 goal of 50% slipping away. And it looks increasingly unlikely that the UK will transpose the target into domestic legislation following its exit from the EU. On the figures: the overall 2015 recy­cling rate in the UK of 44.3% was 0.6 percentage points below the year before, with England’s slump from 44.8% to 43.9% being the key factor because its population dominates the data. Scot­land and Wales, on the other hand, con­tinue to improve their national rates. As is to be expected by such an unprecedented landmark , the data gen­erated mainstream media attention and drew a wealth of analysis and suggested remedies from across the waste sector. For its part, Defra said that a significant fall in ‘other organic waste’ had affected the figures. But this is due to a particu­larly high amount of the material being produced in 2014, which prevented the dip from happening a year earlier. Defra has maintained its devotion to improving recycling and pledged to “encourage best practice across the nation as part of our commitment to protect the environment for future gen­erations.” While sharing successful tactics is unquestionably a good policy, it is a hands-off strategy. With ever-intensifying budget limi­tations, councils tend to refer to exam­ples from others when proposing changes to their waste regimes. So it could be argued they are following this approach already. One theory for the fall in recycling is that more recyclable materials separated by residents are being rejected by MRF operators because of contamination. The figures show an increase of a quar­ter in rejected household recyclable waste in England, with 417,000 tonnes (4.1%) turned away in 2015-16. This has consistently increased since 2011-12, rising from 180,000 tonnes (1.8%) of recyclables in that year. Such figures have been used by some newspapers as evidence that residents are confused by what they can and cannot recycle. In the weeks leading up to WRAP’s Framework for Greater Consistency report last September, the BBC joined in by reporting old reject figures, and suggested that more recyclables were being rejected because more residents were putting the wrong stuff in their bags due to confusion. But this rejection rate remains a very small percentage of the overall recycling tonnage and a dif­ferent explanation is offered by the waste sector. Since October 2014, operators of MRFs that process more than 1,000 tonnes of material a year have had to adhere to sampling regulations which Biffa says have contributed to this shift. The company’s resource recovery and treatment director Dave Heaton told MRW that any increase in rejection of recyclables on contamination grounds results from the drive to improve quality. But Eunomia’s principal consultant Peter Jones pointed out that councils with supposedly more complicated kerbside sorting systems generally reported fewer rejected loads than those with commingled systems. Explaining this trend to MRW, Lee Marshall, chief executive pf the Local Authority Recycling Advisory Commit­tee (Larac), said this could be due to residents with commingled systems not getting the same level of direct feedback on their sorting. One area where the industry and Government appear to agree, however, is that WRAP’s three-option framework would have a positive effect if imple­mented. Larac backed the voluntary scheme, but said “for progress to be made quickly, it will require funding that councils do not have”. While Defra has not pledged any financial support for councils switching, WRAP has held true to its commitment to ringfence some funding. The charity is reviewing 25 applications for support and plans to select successful projects by the end of March. All three options in WRAP’s framework require a separate collection of food waste. But in the aftermath of the latest recycling figures, Larac insisted that compulsory collections were not neces­sary, although it would welcome finan­cial support for a voluntary scheme. Its justification for this was an increase in the totals: 307,000 tonnes of separately collected food waste were recorded in 2015, up from 290,000 the year before. This figure has been steadily increasing since 2010. But the Renewable Energy Association (REA) said that the UK’s food waste collection record was not good compared with other European coun­tries such as Italy, and reiterated its call for mandatory collections. Technical director Jeremy Jacobs pointed out that, of the 18.8 million households in England receiving a waste collection, 5.5 million have separate food waste collections and 4.8 million have food and garden commingled waste collections. Meanwhile, latest WRAP figures revealed that the amount of household food waste in the UK has increased by 4.4% from 2012 to 2015. Some 7.3 mil­lion tonnes were wasted that year, with 4.4 million of this “avoidable”. The most popular suggestion to com­bat the stagnation in recycling is extended producer responsibility (EPR), whereby responsibility for cov­ering the cost of recycling packaging, including collection, is moved from cash-strapped councils to product manufacturers. In the UK, producers pay just 10% of the collection costs and many argue that it should be a greater figure. Notable supporters of this policy outside the waste sector include the influential environmental think-tank the Green Alliance which backed EPR in its recent report Recycling Reset: how England can stop subsidising waste. Producers should take responsibility for most of the cost of collections, it states, because they have the greatest opportu­nity to influence product design. It said: “Hard-pressed councils are having to pick up an unfair share of the bill…but they have no power to bring down the costs. Falling recycling rates show that a new approach is needed.” Evidence of councils struggling with the current system can be seen in what could be the scrapping of a big PFI waste contract because of the cost bur­den. Sheffield City Council is consider­ing the premature end of a 35-year deal with Veolia next year and was holding a key meeting as MRW went to press. Paul Jackson, director of SME re-cycling business the National Resource Consortium, believes such deals could become unsuitable. “Twenty-five or 35-year solutions were ill founded – the market has and will change so much over that time. 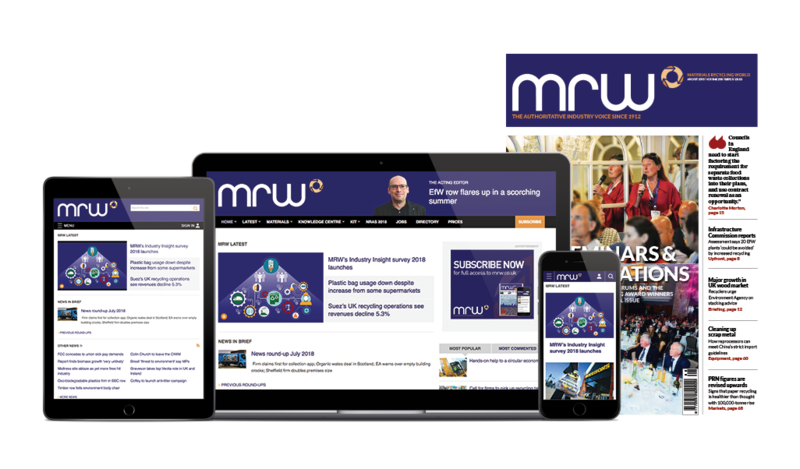 Many of the solutions pro­vided have outdated technology or com­mercial frameworks, and many councils will become disadvantaged,” he com­mented on the MRW website. Other PFI deals may now be under similar pressure, with Viridor’s flagship contract with the Greater Manchester waste partnership contract currently under review. As the 2015 recycling figures were released, the Environmental Ser­vices Association (ESA), Chartered Institution of Wastes Management, Larac and major companies including Suez all said that greater EPR was needed to boost recycling rates. The European Commission is look­ing at EPR in its CE proposals, to which Defra’s Coffey has given a muted response. One response to the household recycling figures believes that they are unrepre­sentative of environmental progress and the metrics should be replaced. Ricardo Energy and Environment, long an advo­cate of change, said the disproportionate effect of garden waste on the statistics shows the weight-based approach is unsuitable. The round of policy recommendations are marked by the pragmatic absence of any expectation that the Government will stump up more cash. It claims still to be determined to reach 50% house­hold waste recycling by 2020 and the clearest path to achieving that now seems obvious. The figures provide proof that what the devolved administrations in Scot­land and Wales are doing is working, while England is failing. A key element of both countries’ policies is providing local authorities with ring-fenced funding for recycling services and setting enforceable targets. In the meantime, a further drop in recycling is expected when the annual 2016 figures are released later this year. CIWM chief executive, and former Defra senior waste official, Colin Church has told MRW: “The key ques­tion is what will the figures released in December for the whole year show and what will the quarterly figures show us going towards that. But I think all of us will be surprised if the drop doesn’t con­tinue”. Currently, Defra is consulting on potential business packaging targets across a number of materials for 2018- 20, and it has suggested three options, varying in their ambition. Most industry respondents are pushing the department to adopt option 2, which has the highest targets for almost all materials. A complica­tion is created by this choice having less ambitious targets for aluminium, which the Aluminium Packaging Recy­cling Organisation has criticised. Option 3 suggests lower increases for all materials, apart from aluminium, which Defra says are “optimal” based on its cost-benefit analysis. The department has no official pref­erence but it is likely to go with the suggestion it spent the most time researching. The framework underpin­ning its 25-year environment plan is expected imminently. Realistically, if any commitment to EPR is mentioned, it will be an impressive achievement of the industry’s lobbying efforts. A positive aspect of the latest council collection figures was the success of East Riding of Yorkshire Council to jump 18 places to second, increasing its collection rate from 55.7% to 66.1% in just 12 months. Paul Tripp, group manager of environmental services at the unitary authority, explains how this was achieved at MRW.co.uk/ 10016393.article. The authority recorded the biggest fall in recycling rates after achieving more than 60% in 2014-15 – one of just 11 to do so. This dramatic fall from grace was largely due to the council’s decision to focus on refuse-derived fuel (RDF) in order to save money. Despite a bold ambition to increase its recycling rate to 35% by 2020, Westminster has slipped down to second-bottom on the list. Its rate has struggled during the past seven years after peaking in 2010-11 at above 25%. While the overall London rate went down, Ealing was one of the few success stories after recording an increase. In 2014, MRW contrasted Bradford’s recycling rate with nearby Wakefield as part of a report on that year’s household recycling rates. Back then, Bradford boasted a rate above 50% with Wakefield way behind on around 38%. Two years later and they are now pretty much level. Now that household recycling in the UK as a whole has fallen for the first time this century, a debate is underway into the policies and strategies that drive recycling practice. Here, three representatives of the leading consultancy Ricardo Energy and Environment, consider how the data can help understand the key issues. As 2020 approaches, there is an increasingly urgent search for a silver bullet for domestic recycling performance, the most obvious of which appears to be the speedy introduction of a new Extended Producer Responsibility (EPR) system requiring the packaging supply chain to contribute more funding, more directly towards collection. Yet, the data doesn’t show conclusively that the existing system has failed or that it couldn’t deliver future packaging recovery targets.